The case against Warren rests, in part, on questions about her managerial qualifications. As Neil Irwin notes in the Washington Post today, she's never run an organization like this before: "She may well be an extraordinary manager ... But given that she doesn't have that experience--or much policymaking experience at all--on her resume, the burden of proof will likely be on she and her allies to make that case." Some also wonder if her passion blinds her to the nuances of the industry, in ways that could actually harm some poor and middle-class people. Those arguments seem reasonable, to a point, and honestly I'm in no position to evaluate them. But some of the arguments against Warren don't seem so reasonable. And that includes Senator Chris Dodd's suggestion that she'd have trouble getting 60 votes for confirmation. Let's take Dodd at his word and assume, as he says, Republicans would try to block her appointment by mounting a filibuster. Why on earth would Democrats duck that fight? This administration is generally averse to conflict over appointments, I know, but this is the kind of clash Obama and his allies should welcome. Many Americans think the White House and congressional Democrats are too close to/too soft on Wall Street. They resent the financial sector bailout and believe Democratic policymakers gave bankers a sweetheart deal because of close personal and fundraising ties. A fight in which Republicans attacked Obama for coming down too hard on Wall Street might go a long ways to dispelling that image. ...as with any other culture, Washington's federal bureacracy is most defined by forces that are invisible and unspoken. Whereas taking chances, thinking differently or questioning authority can be assets in places like Hollywood or Silicon Valley, here they are not. You aren't supposed to step out of line, to create problems for your benefactors, to cause unneeded ripples in the political waters. When possible, you should soften the edges and avoid dust-ups that alert the media. You must always remember your place. 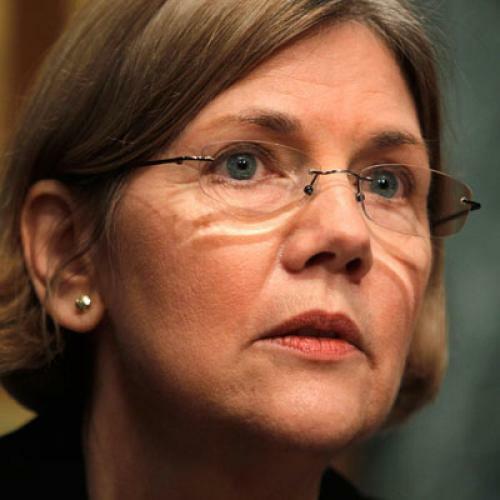 In her short time in Washington, Warren has demonstrated a rather principled disregard for such pressures. She does not see herself as a creature of this place. She sees herself as a woman with a job to do. Again, I'm not the world's (or even this magazine's!) leading expert on the financial industry and regulation thereof. But, based on my limited knowledge, these qualities would seem to be a virtue, not a bug.